StartFX is a forex broker. StartFX offers the MetaTrader 4 forex trading top platform. 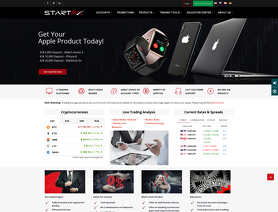 StartFX.com offers over 45 forex currency pairs, indices, shares, energies, commodities, cfds and metals for your personal investment and trading options. Good and relient broker. No commisions on deposit or withdrawal, good education, reasonable spreads. Bitcoin promotion atm is just crazy. MT4 platform. Very good broker to start the way with. I have just started trading with startFX and I am very satisfied with the results so far. Аccount manager teaches me something new every day. As for the platform, it is very user-friendly and intuitive. This review did not come from Germany. It was left from inside the offices of StartFx in Georgia.